Okay, since I did a long, thoughtful, political analysis as yesterday’s post, I just need to write about something fun and easy: lunch. Have I ever mentioned how much I enjoy Japanese food? It’s healthy, balanced, attentively prepared, and artfully presented. Japanese make up our largest group of foreigners living here in Thailand, which isn’t so surprising when you trace history back to Japan’s invasion (note: they didn’t colonize, it was just an invasion! *) of Siam in World War II. They have had a close relationship ever since. Working clockwise from the upper left: Katsu – pork loin breaded in Japanese-style breadcrumbs served with a salad of shredded cabbage and sesame dressing; a boiled egg custard (savory); stewed vegetables and chicken; another small salad; miso soup; pickled radish; steamed rice; and katsu dipping sauce in the center. All this for 230 baht, about US$7.00. For Bangkok, that’s a relatively pricey lunch but it was still a very good value in my eyes. *As for the asterisk, the Thais are very proud that their country has never been colonized by a foreign power and this is drilled into young Thais’ heads from the earliest age. Is it true? Well, you have to add some caveats: Significant portions of the Kingdom of Siam (as Thailand was formerly known) were ceded to foreign powers to avoid a war or potential colonization. Also, Japan occupied Siam during World War II, ostensibly at the “invitation” of its government. An invitation at the point of a sword, if you will. So if you set aside those exceptions, then Siam/Thailand has indeed never been colonized. This entry was posted in Uncategorized and tagged food, Japan, Japanese, katsu, lunch, Pork by christao408. Bookmark the permalink. Thank you for the history lesson. I really enjoy learning about countries and how the people think. I love Japanese food and we have plenty of places around me. Of course, I do enjoy the Thai Restaurant and the twist on their foods. I also had to smile about the the history lesson :)Lunch looks yummy. I love Japanese food. 7 bucks for that would be an excellent deal here! Wow…I wish I was again in Thailand for a $7 lunch like the one you desribed. I thought the Burmese had occupied parts of Thailand before. A coffee and a sandwich at some of the local coffee shops are $7 to $9. I would prefer to have your lunch. I had no idea the Japanese are the largest expats. I always thought it was the Americans or the British. Maybe it’s their visibility (or lack of) that surprises me. wow, looks great! 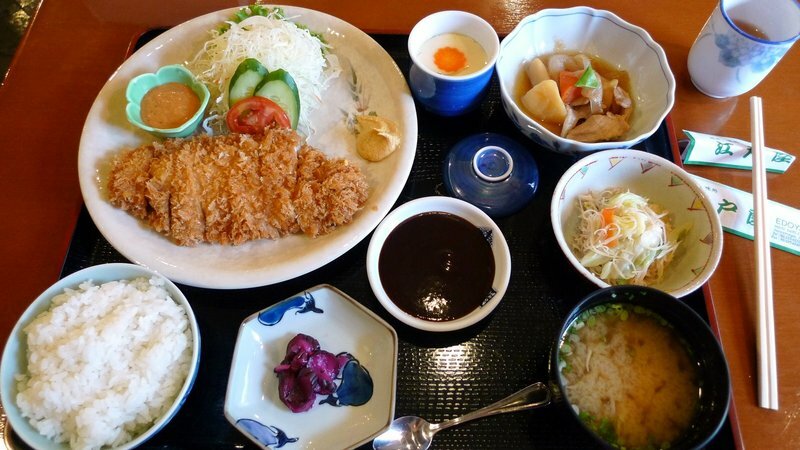 my favorite is to have katsu with curry… is that just a hawaii thing? @Sinful_Sundae – Oh, that’s a very thoughtful thing for you to say and the highest compliment you could pay me. Thank you. @ElusiveWords – I guess visibility is relative. For example, there is one soi (alley) in the Silom/Patpong area that caters exclusively to Japanese. You can see it from the platform of the Saladaeng BTS station. So if you pass that street, you get a big dose of it. Also, if you’re in the mid-Sukhumvit area, from Phrom Pong station to Thong Lo station (where I live), it is the Japanese neighborhood, so signs of them are everywhere. And that’s a good thing…@Matt – You can always return! =D@Roadlesstaken – I was thinking about that Alex. It is hard to get a decent lunch for $7 in the US anymore, especially in a major city, isn’t it? @TheCheshireGrins – @Fatcat723 – I wonder what trouble I will get in with some of my Thai friends or – gasp – husband, when they read this post? “No! Thailand has never been colonized!”@ElusiveWords – Burma sacked two Thai capitals, Sukothai and Ayutthaya but I guess technically didn’t colonize them. Plus, they are Asians, too, so it isn’t really colonization. Whoops, that was the Japanese rationalization! =D@Passionflwr86 – Well, if you’re curious about what you lose through the Americanization of Asian food, I’m going to do a post in the next few days about the “Thai-ization” of the New York deli sandwich. Stay tuned! Wow that is pretty darn cheap!